Product information "Rixen & Kaul KLICKfix Allegra Fashion Bag grey"
Inspired by the Shopper Fashion models. Fresh design with premium features. The pouches, front compartment with zipper and side cell phone compartment provide perfect storage space for everything small and important. When this bag is removed from the bike, its adapter plate hides beneath a padded textile cover, transforming the functional handlebar bag into a chic handbag with carrying strap. With covered KLICKfix Adapterplate at the backside. 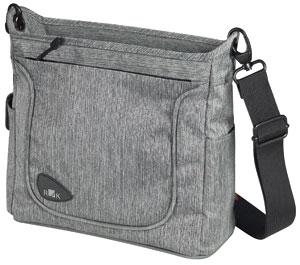 Related links to "Rixen & Kaul KLICKfix Allegra Fashion Bag grey"
Customer evaluation for "Rixen & Kaul KLICKfix Allegra Fashion Bag grey"